Those that have been following this blog with any sort of regularity know that the next-generation Civic is garnering praise from more than just Kelley Blue Book, but the respected online auto valuator’s annual Best Buy Awards are easily their most newsworthy accolades of the year, and to win the top overall honor is certainly something that San Diego Honda fans should be proud of. 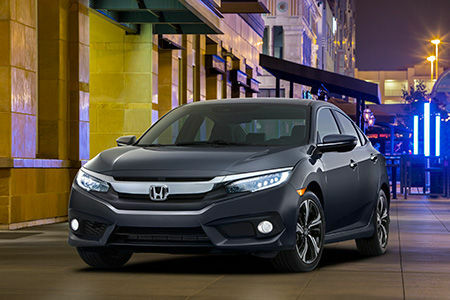 We know the new model year brings new iterations of Civic, as well as new designs, new technologies, new safety features and so much more, but the best-selling vehicle in Honda history’s most pleasant feature, at least according to KBB.com, is its price. All those goodies paired with a reasonable sticker means great value, which is at the heart of these Best Buy Awards. To make things even sweeter for Honda, the 2016 Honda CR-V, 2016 Honda Pilot and 2016 Honda Odyssey also were segment winners in the Midsize SUV, Large SUV and Minivan categories, giving the automaker four wins in nine standard auto segments, including the top honor overall. No other car manufacturer could boast the same, which is why we here at Pacific Honda are enjoying all of this good news as we look forward to a year in which these hot new models fuel the charge in what we hope will be another record-breaking twelve months.